Everyone has had the experience of having a snack machine steal their hope (don’t lie, you’ve felt the sting), steal their sustenance (debatable), and worst of all steal their money (true). Recently I had a similar experience. I was at work and hungry. Well to be fair I wasn’t exactly hungry but I did have a craving for junk food. It’s a habit I’m trying hard to break, and I guess the snack machine thought it would give me a hand in doing so. It did so during an attempt to at obtaining a delicious Grandmas Peanut Butter Cookie. Instead of simply dropping the cookie into my waiting hands the snack machine decided to push the cookie to the side instead of out. Normally when a snack machine jams you can shake it, kick it, or if you’re really desperate put in more money to get it to release it’s yummy snacks. Not this time. The cookie wasn’t stuck in the spring but jammed up against the wall and spring, there was no getting it out now. Not wanting to give in to defeat I dug my last 50 cents out of my pocket and tried for a bag of chips. I mean what are the odds of it jamming a second time, on a completely different food? 100% apparently. This time squishing the bag of chips up against the row above! After kicking, shaking, and glaring I gave into the inevitable. I was not getting a snack. The problem with this whole scenario isn’t so much the snack machine -even though it is a worthless hunk of money stealing metal- it’s the snacks themselves that are the problem for me. 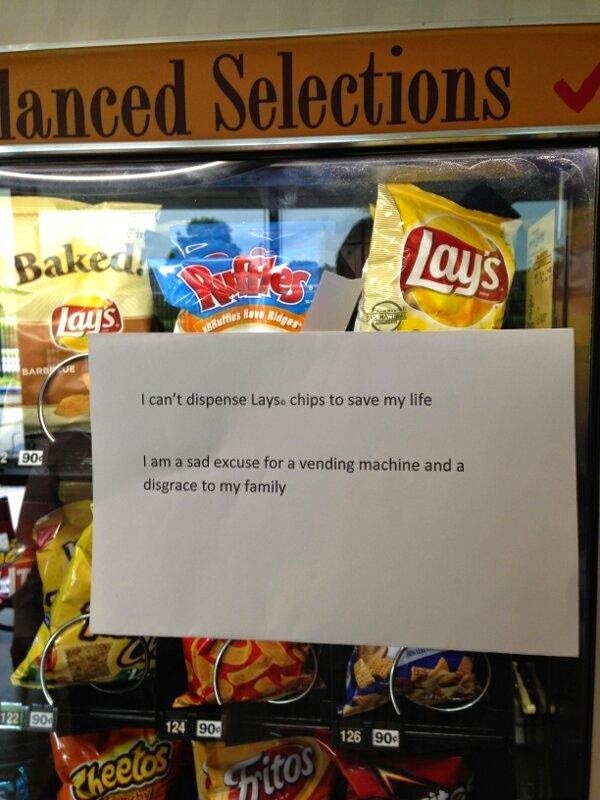 I said at the beginning of this post that I’ve been trying to break my snack machine habit. Too often when I’ve got change to spare I find myself scoping out the machine wondering what to choose. I am by no means overweight or super unhealthy but I do want to live better. Exercise and healthy eating all go a long way to living longer and having a better life. Science says so. So why is it when I am faced with the choice of the snack machine or bringing an apple to work do I usually choose the cookie instead? Is it the convince? Is it that the snacks just taste better? Is it that I don’t have time? Yes, yes, and ye- wait no that last one is just an excuse. There are many reasons I choose the sugary snacks but usually it’s just due to excuses or a lack of self control. In a way I’m thankful to the snack machine because it reminded me that I’m not actually going to die if I don’t have a snack. In fact I’ll be even better off without it’s calorie packed goodies filling me up. What do you think? Have you had any similar experiences?